IT’S AMAZING HOW MUCH YOU CAN ACCOMPLISH WITH YOUR DEBT WHEN YOU JUST TALK TO SOMEONE WHO CAN OFFER YOU SOLID ADVICE. When I was younger I remember my parents always saying they were “in the hole” and talking about their credit line. We were never really went without anything and we still took family vacations (more so as I got a little older). Now, in my early to mid 30’s with a husband and a 20 month old son, we are over $41,000 (Line of credit and two car loans) in debt not including the mortgage. I got my first job at 14 and worked all through high school and college (I was lucky enough that my parents paid for my schooling). I have always been in and out of debt since I was young and it wasn’t until now that I really started to buckle down. It got so scary that we even went through the process of being on the TV show “Til Debt Do Us Part” in hopes of getting us back on track. We did the interviews, booked our sessions, then found out the network didn’t like us. We got along too well and weren’t at the end of our ropes in finance and relationship. I have rolled debt into the mortgage 2 or 3 times (I can’t even remember). One time was after my divorce (I put some debt and the buyout money into the mortgage) and when my new hubby and I went to put his name on the mortgage we rolled his debt into the mortgage…over $45,000! We tried doing Gail’s budget after this experience and failed miserably after one week. We just figured that we were doing OK just saving money by using coupons and went on living with blinders on. When I went on maternity leave in 2010 we were almost $5000 in debt (just the line of credit). By the time I finished maternity leave we were $21,000 in debt , plus over $30,000 in car loans as we both purchased used cars. This debt accumulated just by living above our means (including using the line of credit for a $3,000 down payment on a used vehicle). We don’t try to keep up with the Jones’ with the latest gadgets but we were spending more than we made. In January 2012 I decided to research Canadian Couponing a little deeper to see what else I could do even though we used them weekly. It was then that I found a Canadian Couponing site which no longer exists but helped us learn about coupons. I found some valuable information to help save more money through Couponing such as price adjustments, stockpiling tips, free samples, rewards programs etc. Shortly after I was introduced to Canadian Budget Binder and that’s when my life began to change. I started to learn more tips and tricks for leading a frugal lifestyle, but I still wasn’t doing well enough. Through my “talks” with Mr. CBB I realized it was never going to get better the way were headed and we needed to make a change. I realized that if we didn’t start budgeting and spending less than we earned we would keep digging a hole for our family. My saviour was born in April! Mr. CBB talked about needing BETA testers for his Canadian Budget Binder Spreadsheet (CBBS). Mr.CBB just finished designing his budget in excel for his family and wanted to offer it to the fans if they wanted to use it (for Free). I knew that this was my chance to get us back on track and with his help. I was lucky enough for Mr. CBB to select me and that’s when my money-saving journey began. The first month required a lot of re-calculation, more math than I like to do and some frustration (but it has gotten easier since then). It is still an ongoing process but I am confident now that we can make this work. I was made fun of by my husband and the rest of my family for Couponing so I wasn’t looking forward to their reactions when they found out I was budgeting. My husband was not very receptive to the idea of budgeting as he doesn’t like to be told what he can and cannot do with his money. Inevitably this caused a few money “arguments” and some tension between us. I tried to show him how the CBBS looked every once in a while and what our numbers are but he doesn’t really pay much attention. He gets irritated sometimes when I say we can’t afford something, but other times I unfortunately fall back into my old ways and give in. My parents seemed almost proud of me and have been fairly supportive of this journey. If I say we can’t afford to do something that’s not in the budget I’m comforted knowing they understand. I know I can still do better but right now there are just some things I am not willing to give up (like my cell phone and satellite). I try to find other ways to make up for it like calling my service providers and asking for deeper discounts and my hubby works overtime. A part-time job just doesn’t make sense for me when my hubby can make triple what I would at a part-time minimum wage job (my job does not allow for paid over-time). I have also been trying to sell as much stuff as I can find in our basement that we no longer need to supplement our income as well as doing product testing which pays $20-$40 cash for 30-60 minutes work. Another obstacle I have to overcome is my seasonal lay-offs. I get laid off for two weeks in December, one week and March and for all of July and August (I am a special needs teaching assistant). I have always saved money for these lay-offs in a special account and figured I was doing well enough with that and I can/do collect Employment Insurance for these lay-offs (however that dramatically reduces my income). Normally during these lay-offs I never used to change any spending habits and continued to use our line of credit to go further into debt, but now with a budget I made it through my summer lay-off without using it or living off of the overdraft like we used to. The Grocery Game Challenge (GGC) has helped me out more than anyone could ever know. Our budget is $100 per week (before I stared the GGC we were spending $600-$700 a month plus money on eating out – which we no longer do) and that is for everything from food to health and beauty items to cleaning/laundry supplies and baby items. I’ve never even thought about buying “pink sticker” reduced items like bread before I saw Mr. CBB talk about it. I throw most of them in the freezer anyways. The GGC has worked for me because it holds me accountable to someone for the way I spend my money. If I didn’t use the GGC I wouldn’t really care if I went over my budget. Knowing that it will be on the internet for Mr. CBB and all my fellow fans to see is motivation for me to do well (I compare this to Weight Watchers…I am a Lifetime member and I have always found that when I attend meetings and have the group support and weigh in’s that I do far better. If I just weigh in and leave I am not accountable to anyone and I don’t do well at all. Having people clap for you when you lose a few pounds is surprisingly motivating!) Some weird kind of relationship has developed with Mr. CBB and now all I want to do is make him proud. 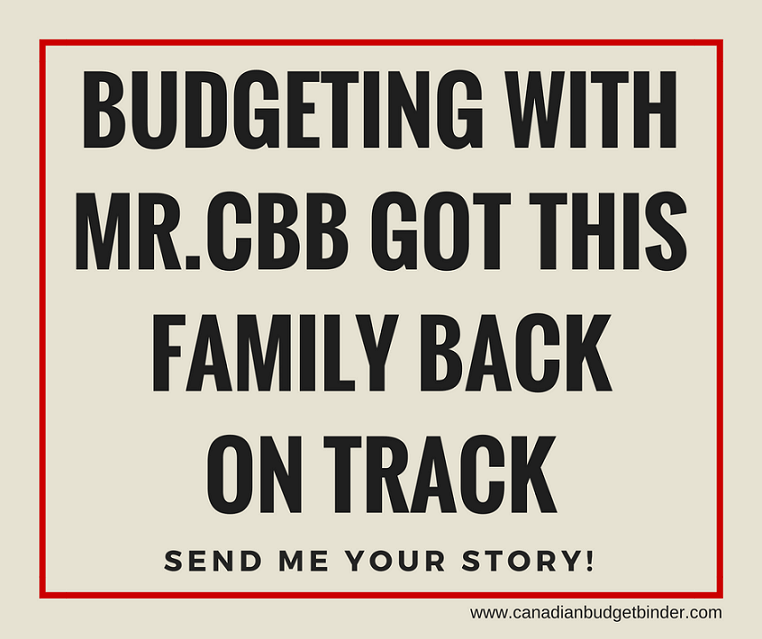 When I began budgeting with Mr. CBB in May my line of credit was just over $15,800. Not even 3 months later it was down to just over $13,500. That was a little help from a lovely gift from my parents, but back before Mr. CBB I wasn’t paying money on it at all except tax returns. I was just using it as income. I began paying money back on a regular bi-weekly basis. I had cut out any savings except for my RRSP until the line of credit was paid. When it was paid I would then start-up my Tax Free Savings Account (TFSA) and education fund (RESP) for my son again. I was extremely proud of myself for making it through my entire summer lay off this year without using my line of credit. Then, In October we started looking for more ways to save money and decided to get a Home-line of credit (a line of credit that is secured with your home and charges prime plus a half percent interest). We put our line of credit debt and both of our car loans into this Home-line plan. I did this because the interest rate on our line of credit was 6.31%, our car loans were 5.99% and 6.99% and the Home-line interest rate would be 3.5%, saving us a great deal in interest payments over time. We pay the Home-line of credit bi-weekly just like a mortgage so this loan will actually be paid off before they were even originally due to be paid off through the dealerships financing companies. I have also started contributing bi-weekly to my son’s RESP again as well. We find ourselves thinking more about purchases, often not buying on impulse and either waiting to get a deal on it or checking free-cycle or Kijiji for items. It’s November now and I’ve caught my husband taking a little more interest in the budget. When I am sitting on the couch working on it beside him he glances at it and ask questions or makes comments. He tries to bring me all of his receipts and he is getting better at saying “no” to people at work who want money for things and saying “no” to himself when he wants something. He also talks to me more when it comes to making purchases. I want to impart financial wisdom onto my son (not that my parents did a horrible job with me but there are some things I wish I knew then that I know now) and have him live a debt free life with parents who are not always stressed out about money. He is my motivation. We are still working hard at our finances but budgeting has gotten us back on track and we will be forever grateful. Dollar Store Home Pregnancy Tests-Do They Work? The Grocery Game Challenge Nov 26-Dec 2,2012 Let it Snow! Great to hear you’re doing well…but as a Special Needs teaching assistant you have a lot more earning power than minimum wage if you had a job on the side. Respite work and tutoring pay a lot more than minimum wage and it is in high demand. When school is our people need child care, so your yearly layoffs are extra income opportunities. Children with special needs also often need help learning non-school skills, such as how to skate, swim, etc. If you played any sports as a teen that you could teach or coach now, your experience with kids with special needs would help you earn more. I have earned a lot of money over the years doing these things, just advertising on kijiji! Thank you for your comment! I can’t remember if the blog post mentions it or not but I worked part time as a Pharmacy Tech for a while as well as I took in my cousins daughter during the summer and babysat her. The problem is that you can earn way more on EI unfortunately then you can working minimum wage jobs that will only hire you for the summer. You also have to take childcare into account. I would pay out anything I earn in childcare. My husband works night shift which prevents me from doing any sort of evening or weekend part time work as well. I have two children now and work full time. Spare time to earn any extra money is completely nonexistent. Fortunately, with the help we received from Mr CBB and our success budgeting we will be out of debt (other than out mortgage) in September 2016. My husband also has a higher paying job now which helps as well. Wow, what an inspirational story. I too tested the budget and it is great. It was working pretty good until our income dropped and our bare expenses were still higher than the income. I found that at this same time I fell away from Mr. CBB as I was embarassed at how things had taken a turn for the worst. I have been volunteering for a year and a half since graduating Teacher’s College trying to get on the supply list in our school board but it has not opened up yet. I have been trying to keep things afloat with not much success. I have wanted to do the grocery challenge but it has been hard as we have not had a specific amount to budget each week with the financial situation. In fact, some weeks I have been trying to feed 3 of us with $30. Now to the good news. Last week I was called to a school as they were unable to get a teacher to fill a half day spot. I found out later that this is the first step to getting on an “Emergency Teacher List”. It is not the “real” supply list but it is a step in the right direction. I was told to expect calls as we live in the north part of the board and there are not many occasional teachers in this area. Unfortunately, I will not know in advance when I will be working or what income I will be bringing in each month. I still have my income from being the janitor at the church we attend, a weekly cleaning job and the occasional opportunity to help with a catering company. I am looking forward to things coming together over the next months as we move forward and get our debt paid off. We currently have two credit cards that are maxed at 1000 and 1500, a personal loan from my parents for $350 to help keep food on the table, a car loan of 21, 000 and the mortgage. The good news is is that with the proceeds from our house sale (we downsized as only one of five children are still living at home) we were able to pay off my car loan, the student loans, a 15 000 personal loan, an insurance loan and the two credit cards (which we have had to use to get through the last while). Loved reading how you got on the budgeting bandwagon. hey Jen you have inspired me to now do more as i see you have done it and it has worked for you i am new to the coupon game and before i was like you n your husband if i wanted it i bought it i didnt care if it was in the budget! I am new to the whole process and just started couponing thanks to a fellow cbb member and i think this coming year i will sit down and plan out a budget and of course start taking part in the GGC! I think with the cpn knowledge and the great info i have found here that i will be able to one day be like others and have a + bank account. thanks for sharing your story much appreciated and good luck to you n your hubby!! This is a great story Jen. I am inspired by your stick-to-it-ivity. I chuckled a bit when you said your husband now tries to bring you his receipts. I also think it was a testament to the strength of your love and respect for each other and your willingness to keep trying that you weren’t a good candidate for the show (which I watched religiously while it was available in New York). Good for you both! Keep it up! This is such a lovely story to hear! I’m so happy for Jen and her family and I hope they stick to their new found path. Awesome job guys! Thanks! I owe Mr CBB so much! What a honest story of hardship and rewards. I saw Hoe Debt Do Us Part for the first time two months ago at my daughters house. ( We don’t have TV) and I was glued to the TV as I watched these people struggle to get out the red. Reading your story gave me the same feeling. Glued to each word you wrote. You are amazing. Keep up the terrific work. Mr. CBB really has found his calling in this whole blogging business that’s for sure. Great story! Thanks so much for sharing! He most certainly has! Thanks! Keep it up Jen. Don’t listen to the naysayers. They’ll still be broke when you’re free. Couponing is a great way to save. Thanks! My dream is to one day be free of debt 🙂 I love how much couponing helps! Good for you! I wish I had started sooner! Jen keep up the good work and use those coupons…People may not understand but when you and your husband are retired and debt free they’ll be green with envy. I’m glad you enjoyed it 🙂 Seasonal work is tough I know how that is but couponing and budgeting really help. Good luck! Thank you for sharing your story Jen. It takes courage to put it out there for everyone to see like that. At the same time I am sure many will find it inspiring and will hopefully take the same steps you have to better their finances. Mr. CBB must be very proud that he was able to be of help to you and to others. I too have found playing the Grocery Game Challenge has helped me spend less on my groceries and has encouraged me to try to make more of my food from scratch instead of buying convenience food (although I still need to work more on that). Reading your shops Jen inspires me as well as I see how well you do at couponing and price matching to save money. Thanks Jen and thank you Mr. CBB for all that you do! Congrats on the weightloss Jen. I have noticed you and Ken have been cooking more in the kitchen from scratch and that is great. You will save so much money by scrapping the premade stuff and doing it on your own. Little at a time you will learn tricks and ways to make it a faster process but at least you aren’t blowing money on stuff you can easily make yourself and be proud of. We both love the Grocery Game for the same reasons as everyone who posts. I also encourage everyone to post in the What’s for Dinner as a motivator to have the fans start cooking from scratch. I really want fans to get back to basics and find ways to make it happen even if that means prep on weekends, crock pots, or freezer stock up meals…. Keep at it! Great story. Nice to read about these ones! I’m looking forward to sharing it too! That’s great to hear! I’m happy things are working out so much better for you! What an awesome story Jen!!!! I’m so glad to hear you are digging out of that debt hole….Mr CBB is helping all of us to do better, he acts as our cheerleader and our best supporter!!!! Thanks to both of you!!! PS… You’re son is a cutie!!!! Hey Hey Hey.. who you calling cheerleader…. what about a hunky Firefighter.. or.. you know.. not cheerleader haha.. Cheers Christine.. you’re awesome! Great post. I know that Mr. CBB has helped a lot of people and it’s great to hear a real life story! Thanks! He has certainly helped me more than he’ll ever know! 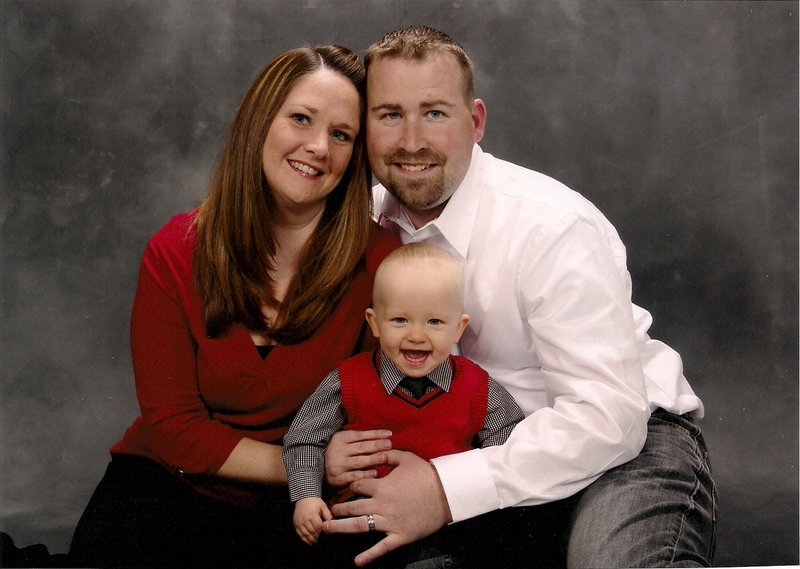 Thank you Jen for sharing your story. A great inspiration knowing it CAN work! thanks again Jen and mr CBB! Go Jen Go! Way to go Jen! Your story is really relate-able. Lots of people would just give up and wait until he house of cards finally fell. Good for you for taking action at the start! Glad to hear your husband is getting on board! I love stories with happy endings!! Budgeting really is the way to go for EVERYONE, rich or broke. Jen, I too have been starting to really look at a budget. Going through some life changing events has forced me to do so….but I’m thankful for that. I don’t want to start my new life “on a bad foot” Congrats to you and your family! You are doing awesome!!!! Thanks Mary! I really do hope to feel that way one day! it’s great that you’ve begun budgeting employing other financially sound tactics to reduce your debt. Keep up the positive progress and it’s good that your husband is warming up to the idea. Mr. CBB is really helpful to so many including myself. My hubby actually just said that he’s interested in reading my post! LOL I know that even though he doesn’t say it, he appreciates what I’ve done 🙂 Thanks! Great story Jen! So glad to see that things are back on the correct path for you and that you’re making some progress. I used to have the same aversion to budgets, but now I couldn’t live without ours. Good for you Jen and thank you for being so honest about your story. It’s always nice to know that we’re not alone in the struggle and it’s encouraging to see the good progress you’ve made. Thanks Beth Anne! I was surprised when I started this journey at just how many people do budget and are on the right track as well as just how many were living beyond their means and drowning in debt…seems like quite a split to me. Jen, it sounds like you and hubby are well on your way to financial peace of mind and prosperity. Congratulations! Keep plugging away it at. Also , it would be wonderful to receive periodic updates from you to gauge your family’s progress. Thank you for sharing your story Jen! I am very proud of the turn around and choices you have made and I hope you are too! Thanks! I really hope to be able to write that post one day in the next few years! So glad to hear that your spouse is slowly getting more and more on board. Also, very interesting to hear that you got along too well for Gail! Congratulations on all of the progress you have made. Sounds like things will be ship shape for you very soon, which is awesome! Stories like these are always great to hear. I am happy for you Jen and hope you continue on your path to financial freedom. Budgeting is a great, but very under-utilized tool by many.